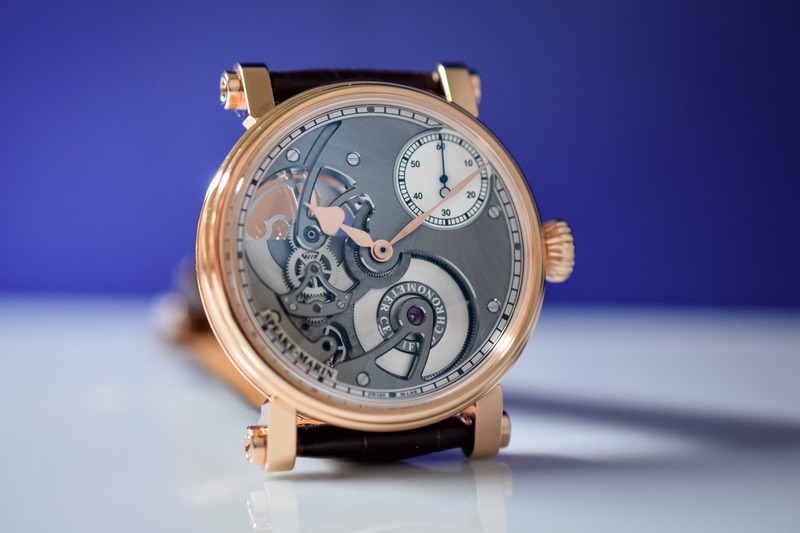 A refined and balanced approach to an openworked dial offset with characteristic Speake-Marin touches. As they say “if you’ve got it, flaunt it”. With a new in-house automatic COSC-certified movement, the dial of the One & Two is openworked to reveal the calibre in almost all of its mechanical glory. Presented in titanium and 18k red gold cases, the One & Two Openworked models prove that a partially skeletonised dial can be extremely elegant. 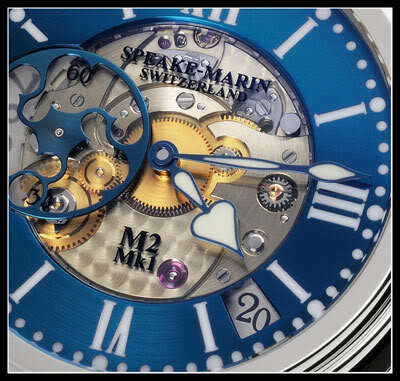 With an exposed barrel and rotor and the small seconds counter perched at 1:30, the action on the dial is guaranteed. Both the dapper One & Two Academic models, reviewed here, and these Openworked models are distinguished by the unusual position of the small seconds counter adding that touch of British eccentricity that the brand cultivates. 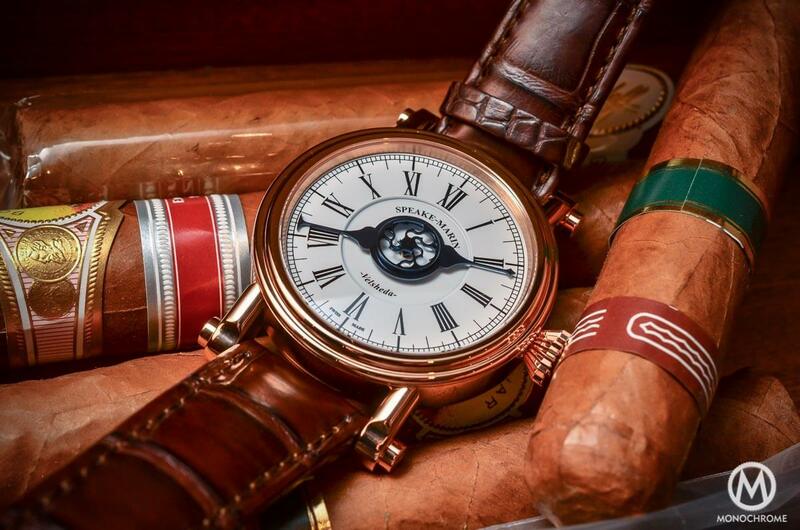 The stately Piccadilly case is a cornerstone of Speake-Marin’s identity and these One & Two Openworked models would not have looked amiss on the wrist of a Regency-era gentleman when neo-classical architecture was all the rage in London and Beau Brummell perfected the concept of the dandy. First introduced in 2003, the Piccadilly has been tweaked recently to present a thinner profile – 10.50mm thick – and the characteristic screwed lugs have been revamped for a better, more ergonomic fit. Another design update of the new generation Piccadilly case includes the new box-shaped glass that reduces the overall thickness of the case. 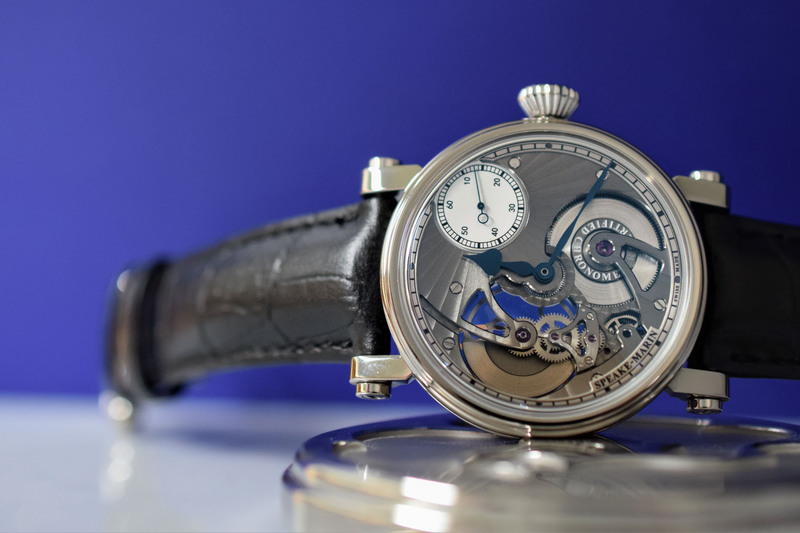 The fluted crown has been relocated to a more central position on the case and is engraved with a topping tool motif – a recurring theme at Speake-Marin. The case is decorated with contrasting brushed and polished finishes and available in two sizes, 38 and 42mm. The red gold and titanium models we are reviewing here are the smaller 38mm size. Partially skeletonised (or openworked) dials are not everybody’s cup of tea but these Speake-Marin models put on a class act. The unconventional position of the small seconds counter between 1:00 and 2:00 o’clock is, if you like, the epicentre of the design and a series of thick grey sunburst Geneva stripes emanate like sunbeams towards the cut-out area of the dial. When viewed in the metal, the stripes reflect the light to great effect. Below the stripes, you will notice the contrasting perlage decoration on the mainplate. A quirky detail for fans of the brand is the way the chapter ring has been literally pushed off the dial by the seconds counter. 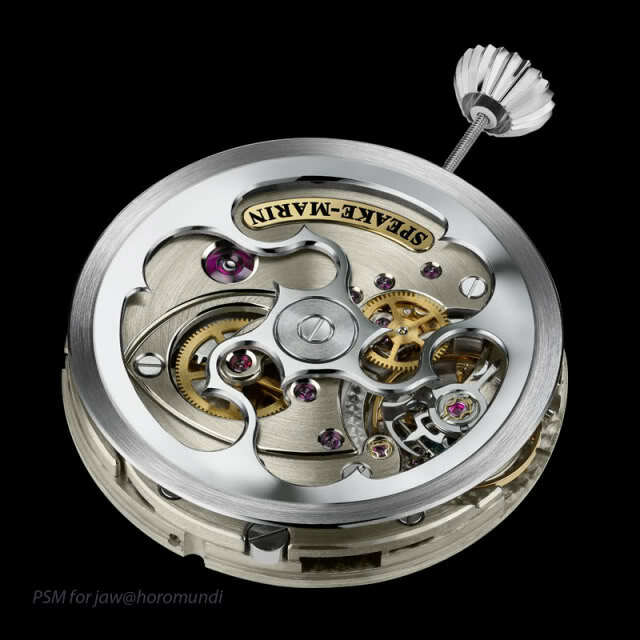 The openworked area of the dial features two practically circular areas, the top one occupied by the micro-rotor and the bottom one by the mainspring barrel. For maximum visual impact, the rotor is a micro-rotor to offer an unimpeded view of the wheel train. The rounded bridges reach in from opposite directions to hold the elements in place creating a pleasing almost yin-yang symbol. 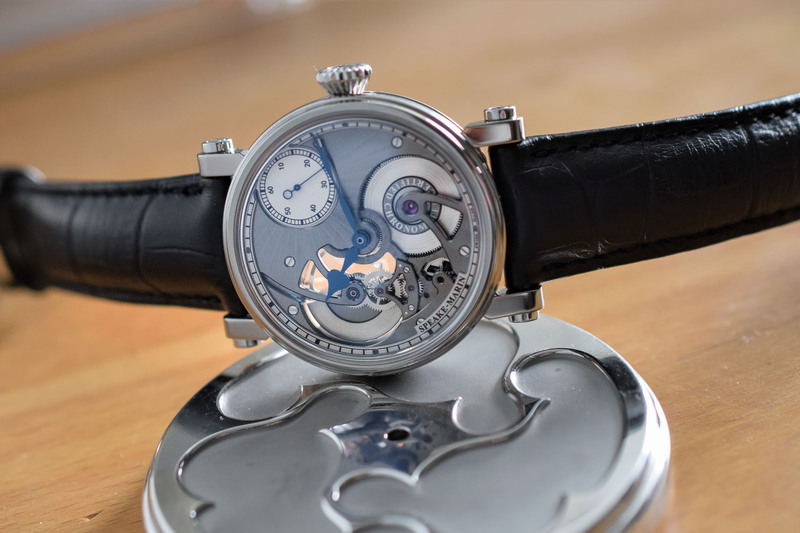 Depending on the position of the rotor, there are fleeting moments when you can almost see the silhouette of a skull (another recurring motif at Speake-Marin), its jaw bone picked out with the automatic wheel-train bridge and the cavity of the skull with the brass topping tool placed on the micro-rotor on the movement side. Counterbalanced by the small seconds counter, the overall effect of the dial is harmonious and elegant. 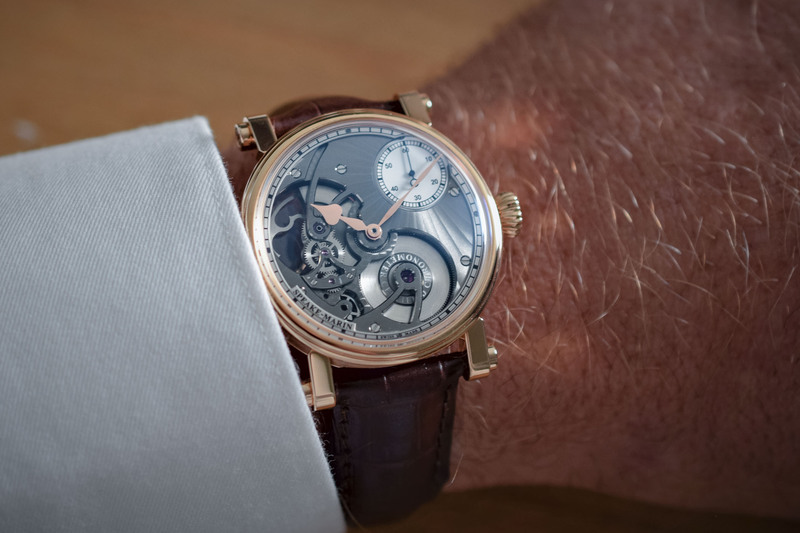 Bereft of numerals, the time is read by the characteristic heart-shaped hour hand of Speake-Marin watches (blue for the titanium model and gold for the red gold) and the elegant minutes hand that tapers in at the waist. Another nice detail is the way the minutes hand extends all the way out to the minutes track for precision readings. 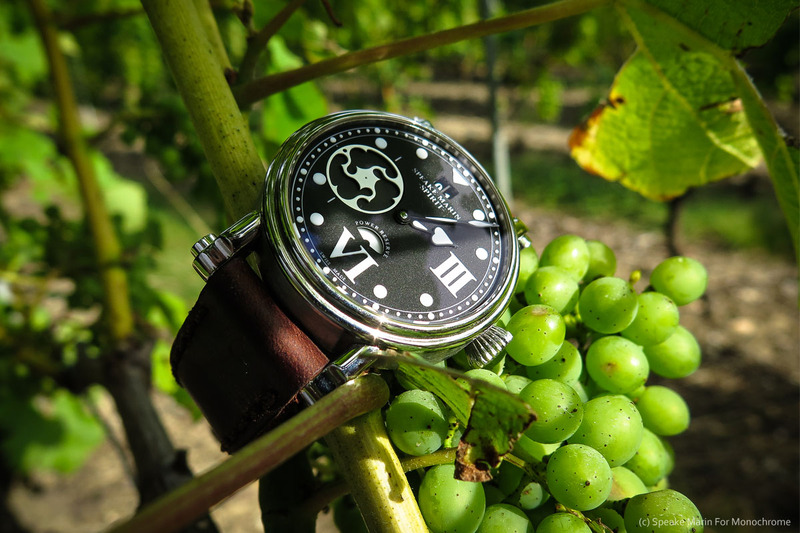 After all, this is a COSC-certified chronometer as the engraving on the barrel attests. 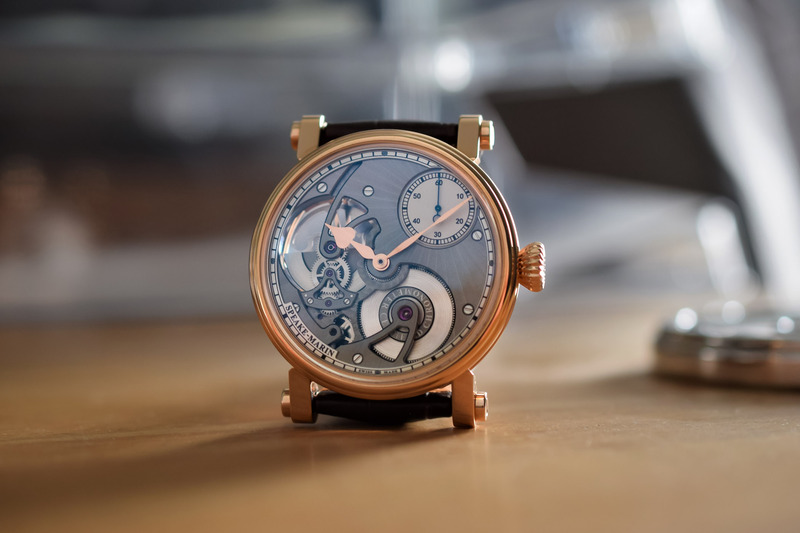 Inside the Speake-Marin One & Two Openworked models is the in-house SMA01 calibre with its eccentric display of the small seconds and incorporation of a micro-rotor. The placement of the seconds counter so close to the crown and winding system, without any ring, attests to the sophistication of the module. 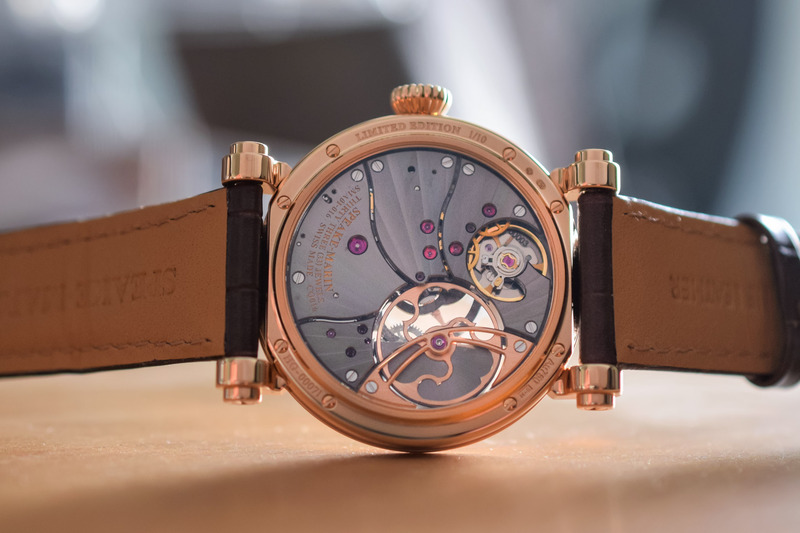 Admittedly, the view is much more interesting from the dial side but the exhibition caseback reveals five brass bridges that fan out across the caseback with diamond-polished black-coated gold angles and Geneva stripes. In pride of place, the large brass topping tool with its bevelled edges and another cut-out area for a view of the escapement and balance wheel. Beating at a frequency of 4Hz (28,800vph) the movement, entirely assembled and adjusted by hand, offers a 50-hour power reserve and is certified a chronometer by COSC. 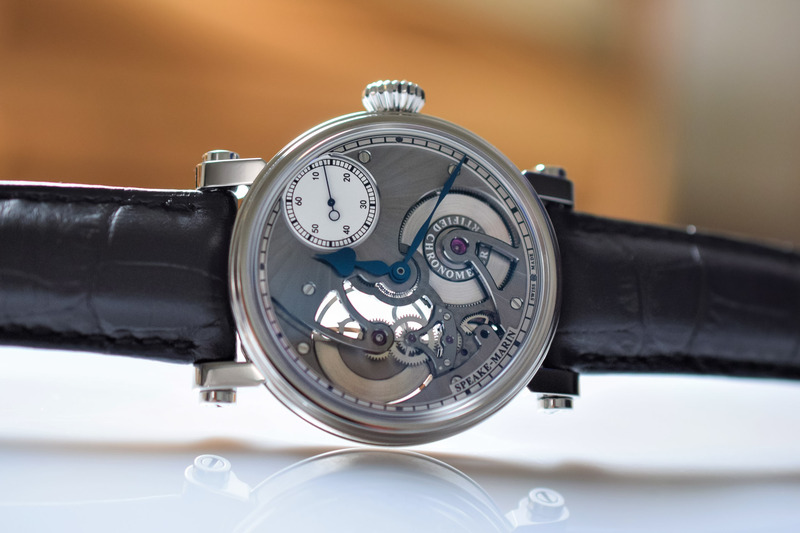 A handsome interpretation of an openworked dial and the idiosyncratic touch of the small seconds at 1:30 lend this watch its unique Speake-Marin personality. Beautifully finished as befits a watch of this category, the sunburst stripes on the dial and caseback add a sophisticated sheen while the exposed rotor and mainspring provide a satisfying view of the mechanics on the dial side continued on the back with a view of the escapement. The 38mm model in red gold is a limited edition of just 10 pieces and comes on a dark brown alligator strap with a pin buckle while the titanium is produced in a limited edition of 20 pieces and comes on a black alligator strap with a folding clasp. Another design upgrade is the incorporation of the straps closer to the case for a more compact look. 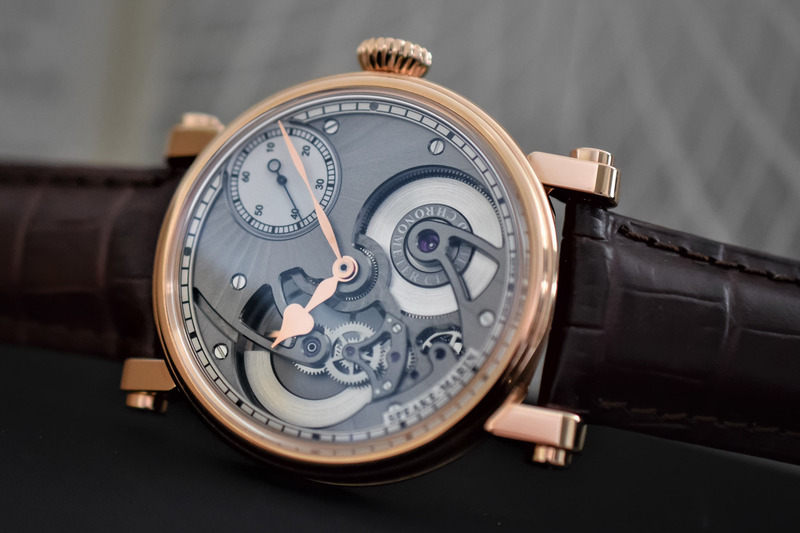 The One & Two Openworked in titanium retails for CHF 16,200 (incl. taxes) and the red gold for CHF 29,600 (incl. taxes). 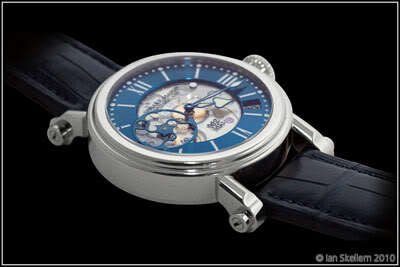 More information at www.speake-marin.com. Just for clarity, this model is not called the “One & Two”. The “One” is the RG version, the “Two” is the Titanium version.